I read many interesting books in 2016, click here to see my reading highlights, however, Disgrace is outstanding in many ways. This is a novel that could have perfectly been over 400 pages, however, the author was sparse with words and still put across his message accurately. The editing and writing of this novel is perfect. He described the complexities in human relationship using specific people and their every day life. The quality and form of his prose, the characteristic of his sentence is something I cannot describe in words, it is just a whole different level. With this book he won the 2003 Nobel Prize in Literature, 1999 Booker Prize, 2000 Commonwealth Writers' Prize: Best Book, Africa. It is also one of the best 100 novels written in English. He surely deserves all of them. I hope I am able to enjoy all of his works as much as I have enjoyed Disgrace, also I look forward to seeing Disgrace the movie. Have you read Disgrace? Have you read other works of J. M. Coetzee? I am glad that since I started this blog, books by authors from different countries in the African continent are making my book of the year; Zimbabwe 2012, Mozambique 2013, Tanzania 2014, Nigeria 2015 and lastly South Africa 2016. Please click here to read about this compilation. Please click on image to read review of Disgrace. Nice review, Mary.I have been meaning to read Coetzee's works for ages now. 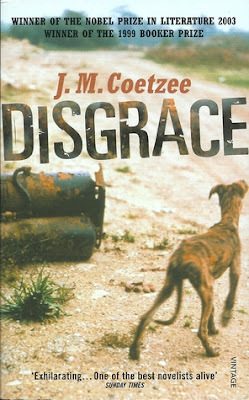 This was an interesting read, Coetzee is just incredible with words.